Kilkenny retained the All-Ireland senior hurling title thanks to a dominant second-half display against Galway in the Croke Park final. TJ Reid's goal put the Cats ahead before Galway seized control and seven points from Joe Canning helped them into a 0-14 to 1-8 lead at the break. 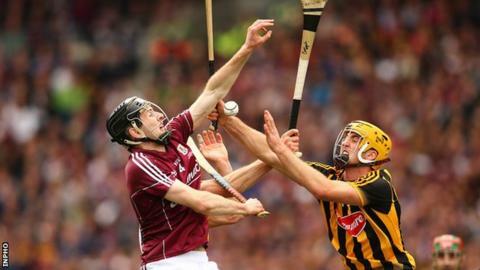 Kilkenny piled on the points as they swept Galway aside in the second half. Canning netted in added time but the Tribesmen missed out on a first Liam McCarthy success since 1988. Reid fired in Kilkenny's only goal after 13 minutes before Galway bossed the remainder of the half and deserved their three-point advantage at the interval. However, they were fortunate to still have 15 men on the pitch after Johnny Coen was shown only a yellow card for a high challenge on Colin Fennelly. It was all change on the restart as Kilkenny took a grip on affairs to claw back the deficit before storming clear. Reid top-scored with 1-7 while Ger Aylward tagged on three points for Brian Cody's men. Canning was contained in the second half although he grabbed a late consolation when his 20m free sneaked in. Kilkenny eased to victory, with the Leinster champions chalking up their 36th All-Ireland triumph.